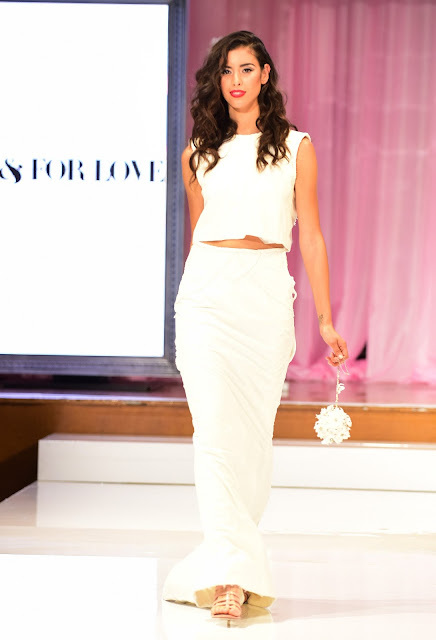 Toronto’s fashion elite gathered at the Carlu downtown for the 12th Annual White Cashmere Collection show in support of the Canadian Breast Cancer Foundation and it was fabulous. The show featured 15 top Canadian bridal designers who meticulously crafted pieces using mainly, and quite often unbelievably - Cashmere Bathroom Tissue. If you’ve been to a bridal shower and played the classic game where everyone makes dresses out of the same household material, this year’s White Cashmere Collection will absolutely blow you away! The designers were able to create such intricately detailed pieces, to say they took the game up a notch would be a huge understatement. As the model “brides” were helped onto the stage by two “grooms” and walked down the all-white runway under a gorgeous chandelier, I could hardly believe what I was seeing and found myself doing double takes at almost every step. The dresses were breathtaking, and moved so well it seemed impossible that they were made almost entirely out something I could find at home in my bathroom. With such incredible softness and durability, it’s not surprising that Cashmere Bathroom Tissue is Canada’s best-selling brand!